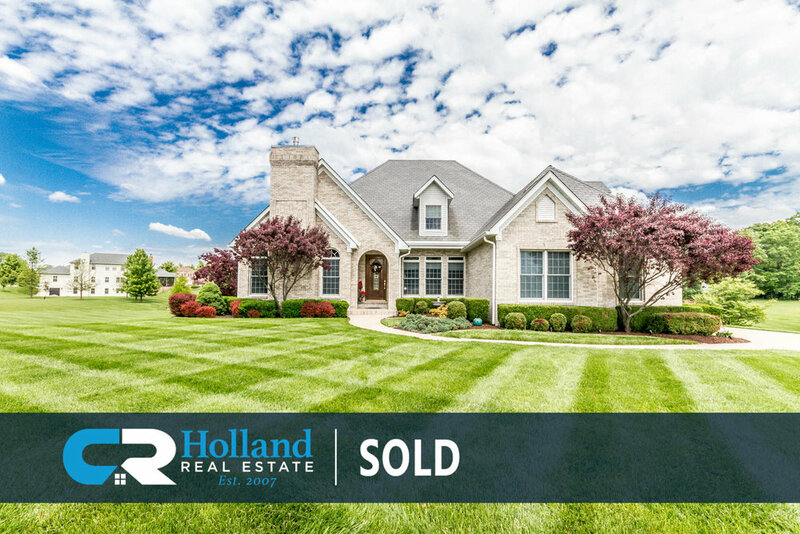 Sold by Chad Holland of CR Holland Real Estate. This amazing 5,100 sf custom-built 4 bedroom home is located in O’Fallon, Illinois. This home sites on more than one acre and features a custom designed pool surrounded by mature landscaping that includes a waterfall, boulders and a variety of perennials that capture the beauty of the surroundings. Sold by Chad Holland of CR Holland Real Estate. Located Crown Point in O’Fallon, Illinois, you will notice the elegance of this 6 bedroom 5,600 sf custom built home as soon as you walk in the door. Details include custom moldings throughout the entire home, 9ft ceilings on the main and upper floors and 10 ft ceilings in the basement and 4 fireplaces. SOLD!!! Located in Cobblestone Ridge, this 3,946 SF, 5 bedroom home was built by State Construction and has a full walkout basement. The main level features a 2 story great room, an office, a dining room, an eat-in-kitchen with a breakfast room, a hearth-room with a stone fireplace, a large laundry room and a main level master bedroom with his and hers closets. Located in the Hearthstone Subdivision, this Incredibly spacious 4,100 + SF home features 4 beds (all w/walk-in closets and bathrooms) including a gigantic master bedroom and a full basement. The exclusive Hearthstone neighborhood is renowned for its custom homes, walking trails, resort style pool, playground and well-lit sidewalks. Located in Windsor Creek, this 4-bed home has a finished walkout basement and an open floor plan with a Split Bedroom concept. The main level features hardwood flooring throughout the great room, dining room, eat-in-kitchen & breakfast nook. The dining room has wood planked flooring in the coffered ceiling. State Construction is a third generation home builder located in O’Fallon, Illinois that has been building homes in the O’Fallon area since 1967. Their years of experience have given them an understanding of people’s needs and wants. State’s team works closely with every client to ensure their taste, budget and schedule are met. D&F Contracting is an affordable, high quality builder that can satisfy all of your needs in regard to new construction. Since he started the company in 1996, Herbert "Junior" Frentzel has built hundreds of homes all across the St. Louis metro area. Using a simple approach, D&F works with you to be involved in the process of customizing your dream home. McBride & Son Homes core Philosophy is to provide quality housing for all stages of life. McBride is building in three communities in Southwestern Illinois including the Woodlands at Far Oaks in Caseyville Illinois, Green Mount Manor in Belleville Illinois and Stonebridge Estates in O’Fallon Illinois. CR Holland Real Estate combines the talents of an experienced sales team to assist you with the purchase or sale of your home from start to finish. We understand that every real estate transaction is personal and exclusive to you – sometimes complicated and always unique. Whether it's the sale of your home, purchasing a new home, the disposition or acquisition of an apartment complex or another property asset, we are experts at providing the most cost-effective and sure path to a closing. Our Construction division provides the resources to update and remodel your home, get your home ready to sell or ready to move into. The CR Holland construction team has a combined 60 years of experience and will assist our sales team to bring successful closure to your real estate deal. Our mission statement echoes our belief the importance of a commitment to quality, honesty, value and client satisfaction. We will listen to your needs and concerns, address them positively and offer alternatives to achieve a successful resolution. We research and analyze the market and will guide you through the home-buying/selling process. We have lived in the O’Fallon area all our lives. We were born here, we grew up here and we are raising our families here. We are familiar with the schools, the various communities throughout the area, including O’Fallon, Shiloh, Scott AFB, Belleville, Smithton, Swansea, Columbia, Troy, Fairview Heights, Caseyville and the many resources our communities provides for your children’s growth and development. Let us share our personal knowledge and experience with you. We look forward to the opportunity to welcome a new family to our community. View all listings in the O'Fallon, Illinois area or click search criteria in the top right corner to filter results by price or property type. Sign up to receive our monthly newsletter and up-to-date real estate information.